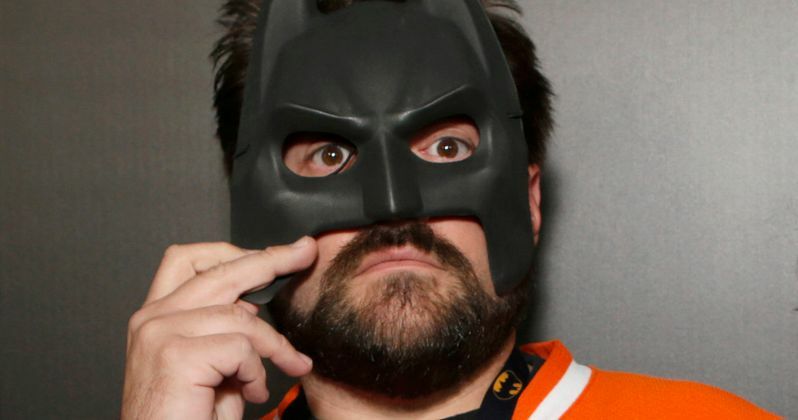 Fake Batman v Superman Script Written and Leaked by Kevin Smith? We just received an interesting tip from an anonymous source deep within the Batman v Superman: Dawn of Justice production. This comes just moments after we posted a story about the introduction of three new, lesser-known heroes in the movie. /batman-v-superman-may-introduce-3-lesser-known-dc-comics-heroes/Badass Digest has gotten their hands on a pdf that claims to be the legitimate shooting script, and in it, there are a number of new secondary characters and locations. This came hot on the heels of Latino Review claiming four new villains were going to appear alongside Lex Luthor. Well, guess what? If we're to believe the email we just got our hands on, not only is the script fake...It was written by Kevin Smith! Yes, that Kevin Smith. The director of Clerks and Red State. The guy who has been dropping Batman v Superman hints since the film was announced. The same guy who is best friends with Bruce Wayne himself, Ben Affleck. Kevin Smith wrote the screenplay in conjunction with Warner Bros., with the studio purposely leaking the script to various movie bloggers and sites, helping to throw the scent off what director Zack Snyder was actually attempting to accomplish with Batman v Superman. This isn't a scoop regarding the plot or the details of the Batman v Superman movie or am I writing you in order to spoil or disappoint the general public. My insider info regards a who has been the source of the vast majority of leaked information as regards to the movie and more importantly why. Up until last year I worked for as a PA for a Warner Bros. exec until I was promoted to marketing. It was here I and several others where approached to work, directly and indirectly, for Susanne Knoll and sometimes Deborah Snyder. It was here that I became a part of a particular strategy that Warner Bros has been using to great effect. Early this year a Screenplay for Batman v Superman: Dawn of Justice which was commissioned by Warner Bros was leaked to several gossip sites. It was a scanned PDF of the entire screenplay baring a official Warner Bros watermark. This script has been the source of almost every leaked detail about the movie for the last six months. It has been posted on sites then quickly removed due to cease and desist letters from Warner Bros. But it is written by neither David S. Goyer or Chris Terrio. It was written by Kevin Smith. Late last year both Charles Roven and Zack Snyder approached Kevin Smith with a early treatment for the film and It was Kevin Smith who came up with the idea to write an entire screenplay based on it but with several huge red herrings and changes which do not appear in the final film. These include plot points and characters etc etc. and 'leak' it online. My job was to pose as a worker at Warner Bros who was leaking the screenplay. There were several others involved who posed as recently fired members of the production, interns and special effects artists and we all spread the misleading info around the web. None of this was done maliciously and was a strategy to misdirect much of sites that intended to spoil the film. So nothing we've heard, except information in official press releases, has been true about Batman v Superman: Dawn of Justice leading up to this point in time. What do you make of this new information? Do you love or hate Kevin Smith more now? And you think this strategy worked?